Kitchari (Kicheri, Kichadi, Khichari), a soupy porridge made from rice and mung beans, is used to purify digestion and cleanse systemic toxins. Ayurvedic physicians often prescribe a kitchari diet before, during, and after panchakarma, a rejuvenative treatment that cleanses toxins stored in bodily tissues as it restores systemic balance. Kitchari provides solid nourishment while allowing the body to devote energy to healing. You can safely subsist on kitchari anytime in order to build vitality and strength as it helps balance all three doshas. For restless vata, the warm soup is grounding; for fiery pitta, it’s spices are calming; and for chilly kapha, it provides healing warmth. [sociallocker]Ayurveda believes that all healing begins with the digestive tract, and Kitchari can give it a much-needed rest from constantly processing different foods while providing essential nutrients. The blend of rice and split mung beans offers an array of amino acids, the building blocks of protein. Its mixture of spices is believed to kindle the digestive fire, which can be weakened by poor food combinations. There are several variations to a basic kitchari recipe and the one below is basic, easy to start with, and balancing to all three doshas (vata, pitta, and kapha). You will find that the ingredients are readily available at most health food stores. ½ cup split yellow mung dal, rinsed well, soaked overnight and drained. (It is best to use mung dal with the hulls still on if you tend toward constipation)—you can also use green mung beans, whole or split. In a heavy – bottomed pot, heat the ghee on medium heat. Ghee burns easily, so be careful. Sauté the mustard seeds and cumin seeds in the ghee until the seeds pop. Then add the drained mung dal, turmeric and salt. Stir until the mix almost starts to stick to the bottom of the pan. Then add the rice, water, coriander, and ginger. Stir well, making sure nothing is sticking to the bottom of the pressure cooker or pot. Cover and bring it to a boil on high heat. Then turn the heat down and let it simmer until both the rice and dal are mushy. Kitchari is basic to my diet. Basmati rice and mung dal together create a very balanced food, that is an excellent protein combination and is good for all three doshas. It is easy to digest and can be digested when nothing else can be digested. Kitchari gives strength and vitality and is excellent for detoxification and rejuvenation. I use it as mono-diet during my home detox programm ( Panchakarma ) and eat it at least once every week. I experiment with spices and amount of water and I have to admit: I can’t have enough of it! It actually tastes pretty good, better than it looks )). I’m really excited about making Kitchari. I have time off from work very soon and will be able to dedicate significant attention to working with Ayurvedic approaches. Thank you so much Larisa for sharing your experience and knowledge! You will love it, you will see. I just had Kitchari today. Did you take the Dosha-test yet? As I can recall you are a Pitta type. You can find suggestions for your body-mind type in “Food list for the Pitta person”. I’m curious, would using brown rice or black “forbidden” rice be a problem for kitchari? It seems like this would make it a bit more substantive and include more nutrients compared with white rice. This recipe is used for ages because the proportions and ingredients are ideal for the digestion and protein intake. All other kinds of rice can be consumed separately. See also Food List for the Kapha (Pitta or Vata) person to find out what kind of rice is good for your constitution. Would kitchar help with acid reflux/stomach ulcer? Ayurvedic physicians often prescribe a kitchari diet before, during, and after treatment. 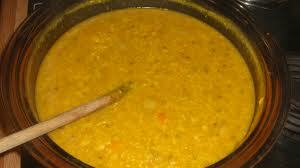 Kitchari provides solid nourishment while allowing the body to devote energy to healing. However,this is not a replacement for treatment.